Record number of “great” earthquakes in April? The Pacific Tsunami Warning Center (PTWC) stated that April 2014 “easily” smashed the record for the most large earthquakes in one month since the Center started recording earthquakes in 1949. The earthquakes started abruptly on April 1, when a major one, 8.2 magnitude, hit Chile. The PTWC considers earthquakes greater than a 6.5 magnitude as large. During the month of April there were 13 major earthquakes. Though smaller earthquakes occur almost on an hourly basis on the earth, a normal month only averages between one and two large earthquakes exceeding 6.5. The PTWC noted that in April five of the earthquakes were greater than 7.8, resulting in tsunami alerts. Having 13 large earthquakes happening in one month (compared to a monthly average of one to two) is a significant seismic event. The Center had no explanation on why there was such a dramatic increase. Normally earthquakes spawn off each other and are found clustered together in certain areas. However, during April, the large ones were spread around the world. Large earthquakes hit Chile, Solomon Islands, Canada, Mexico, Nicaragua and South Atlantic. Major earthquakes in the South Atlantic region are rare events. The PTWC was first set up in 1949 to monitor earthquakes and related tsunamis in the Pacific ocean. 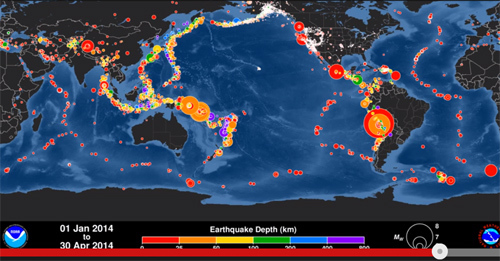 It expanded its network of sensors after the 2004 earthquake/tsunami hit the Indian Ocean and now records seismic activity over most of the world. The PTWC created an animation showing the earthquakes happening day by day between January 1, 2014 and April 30, 2014. This includes all earthquakes small and large. The size and color of the dot reflects the size of the earthquake. 1-2 magnitude: People will not feel these earthquakes but instruments will detect them. 4 magnitude: An earthquake this large can crack walls. Trees can be weakened. 5 magnitude: Furniture will be moved in a home and it can damage buildings that are poorly constructed. 6 magnitude: At this level walls can collapse. Fireplaces are particularly vulnerable. Depending on the quality of construction damage can range from moderate to heavy. 7 magnitude: All buildings in the area will suffer major damage. There will also be cracks in the ground and potential for landslides. 8 magnitude: All buildings will be destroyed. As I noted in previous articles, earthquakes will be one of the significant events marking the end times. Throughout the Bible we see progressive revelation as we draw closer to a prophesied event. As an example, in the book of Genesis we have a the first vague reference to the coming of Jesus. After Adam and Eve’s fall into sin, we are told the seed of the woman would stomp on the head of Satan (Genesis 3:15). As we draw closer to the coming of Christ, the revelation becomes more detailed. Moses describes Jesus as a prophet (Deuteronomy 18:15). When Micah shows up, the revelation is much more specific. He prophesies the actual place where Jesus will be born — Bethlehem (Micah 5:2). Isaiah, a contemporary of Micah, prophesies about Jesus’ death (Isaiah 53). Jesus says His second coming and the end of the age will be marked by an increase in earthquakes in various places. (Matthew 24:7). Jesus further describes them as “Great earthquakes” (Luke 21:11). Generally felt he had his vision during the reign of Nero 60 AD or Domitian 95/96 AD. In his end-time vision recorded in the Book of Revelation, the Apostle John says there will be one “great earthquake” that will stand out from the crowd. It will be the mother of all earthquakes. This “great” earthquake combined with three other signs (blood moon, solar eclipse, and stars falling from the sky) will mark the opening of the sixth seal (Revelation 6:12). He does not mention where this earthquake will take place. Uncertain if his vision is legitimate. However, Joel prophesied that in the end times, the Holy Spirit would be poured out and old men will dream dreams and young men will see visions (Joel 2:28). David Wilkerson has a vision of a massive earthquake in the US. It will be so large, networks will stop regular broadcasting to film its aftermath. Wilkerson believes it will happen somewhere else other than California. He says the US earthquake will be one of the biggest news event of modern times. He adds that it may be preceded by a massive earthquake in Japan — (The Vision published in 1974). David Wilkerson dies in a car accident on April 27, 2011 two weeks later a massive earthquake hits Japan March 11, 2011. Next PostEarly image of Jesus found?